Spokes Bulletin 123 is hitting the doorsteps of all Spokes members, 1200 decision-makers across Scotland [including all 129 Scottish MSPs and all 132 Edinburgh+Lothians councillors, transport consultants, health officials, etc, etc] with copies for a further 10,000 other cyclists and interested individuals through bike shops, libraries etc throughout Edinburgh, Lothians and beyond. [p1] CORRECTION The article also says… “4.2% of Edinburgh people say their main travel mode is bike.” We should have said that 4.2% of all journeys in Edinburgh are by bike (+/- 1.2%). See below for explanation. 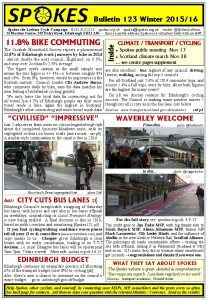 [p8] Why has cycling grown in Edinburgh? [p4] Council still has plenty to learn! [p6] Trunk Road Cycling Initiative – and, not updated for 20 years! Everyone joining Spokes in the next few weeks will be sent these inserts along with the new Bulletin [until they run out]. Having more members helps us and we hope to help you in return by keeping you in touch with what’s happening and what you can do about it! You’ll get a roughly-monthly email in addition to the thrice-yearly Bulletin. We have spares of the new Bulletin for bike leafletting at workplaces, shops etc – let us know if you could use a supply. Many Spokes members take a regular supply of each issue for their local workplace, shops or other useful destinations. *If you like our tweets, please retweet!! The confusion arose because we took the figure from a government table called Main Mode of Travel 2014. In fact the table shows all journeys (as recorded by householders in a travel diary). Of course, many journeys are multi-modal: you may cycle to a train, then walk at the far end. The statistics record only the longest segment of multi-modal trips, so most cycle trips which are part of multi-modal journeys are not counted, and therefore the 4.2% figure may be a slight underestimate. Finally, due to the sample size, the 4.2% statistic is +/- 1.2% (with 95% confidence) meaning that the true figure almost certainly lies between 3.0% and 5.4%.